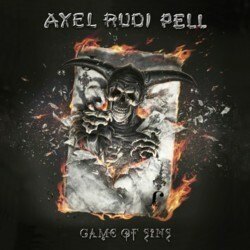 If ever there was a guitarist who needs no introduction, it’s Axel Rudi Pell. The man who celebrated the twenty-fifth anniversary of the launch of his solo career with a cracking three-hour set at the Bang Your Head Festival in July 2014 is pretty much an institution, with some fifteen studio albums to his name as well as numerous compilations and five live DVDs. ‘Game Of Sins’ takes the studio tally to sixteen and, as you might expect, is as consistently sharp and erudite as any of its predecessors. OK, so there are those that argue that there’s nothing particularly innovative about Pell and his music, and that what you’re effectively getting lies in the classic rock sound of, say, Dio-era Rainbow with the obligatory dungeon and/or dragon along for the ride. But isn’t that indeed the point? What Pell and his apparently flawless band – vocalist Johnny Gioeli, keyboard player Ferdy Doernberg, bassist Volker Krawczak and drummer Bobby Rondinelli (another man who, through his work with Rainbow and Blue Öyster Cult, scarcely needs an introduction) – have done is to take that classic rock sound and endlessly refine it album-by-album, year-by-year, thus adding to its immortality while at the same time keeping it fresh and invigorating. Songs like the frenetic ‘Falling Star’ and the epics ‘Forever Free’ and the title track itself (both of which stretch out past the eight minute mark) wear their credentials loud ‘n’ proud, never disguising their roots but in fact openly boasting of their heritage, and if ‘Lost In Love’ is a little too lighters-in the-air for your tastes you can be sure that hot on its heels will come something considerably more up-tempo (in this case, ‘The King Of Fools’), or more guitar-showroom (‘Till The World Says Goodbye’) . And if that’s not enough, the digipack CD features a bonus track, a lengthy stab at ‘All Along The Watchtower’ which is, as you might expect, quite stunning. There have been many attempts to write off classic rock/metal over the years, and they’ve always failed. Music like this is timeless: it has an eternal, ethereal quality to it, and musicians like Pell contribute to its longevity. Long so may it remain.